It has been a long time since Joe McMahon has released an album, but the wait has been well worth it. Earth Mantra is proud to present to you his latest release entitled Ocean Music. 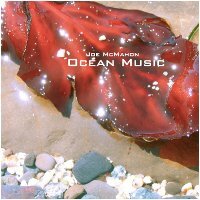 Built reflecting Joe's "impressions of oceans ancient and modern", this release is a collection of gorgeous experimental ambient goodness. It is not easy to characterize this music, because it is very unlike any we have previously heard. It is undoubtedly ambient, moving at a luxuriously slow pace, but this is very unlike most ambient music we have heard. The music is very clear, with a beautiful, almost crystalline clarity. And there is also a delicious experimental finish to the music that really makes this an exquisite release, a thoroughly unique combination of styles that we find irresistible. What are we blathering on about? Well, in our minds at least, when we think of ambient music we are usually thinking of mellow, spacey sounds floating in a sea of reverb. Joe's new album is nothing like that, composed of very electronic, almost glistening sounds in a completely dry but completely clear background. And it rocks. His pacing is utterly exquisite, never moving too slowly or too quickly, and with much delicacy. The music is clearly synthetic and yet it oozes organic like a black smoker at the border of the continental rift. The compositions themselves are masterful. In short, we seriously love this new album by Joe McMahon - and we hope to hear much more from him in the future, this time with, hopefully, a much shorter wait. This is a remarkably good minimalistic and experimental album. The music is like the sunlight that glimmers on gentle waves, light and hypnotic. It is music for those lazy days when you just want to relax or are in a light contemplative mood. This is one of those albums where the more I listen to it the more I like it.